On Monday, the kiddo had a day off of school and I had some vacation time to burn. So, I took the day off and we took a day trip to Dubuque, IA. Yah, yah, I know. Iowa (and Dubuque in particular) doesn’t exactly sound like a thrilling mecca to visit. But, as a day-long family adventure, I highly recommend it. Did you know that there’s a branch of the Smithsonian in Dubuque? Yep, it’s the Mississippi River Museum and Aquarium. We spent a lovely afternoon there, walking through old ships, watching otters play, touching sturgeon and crayfish, and checking out a bunch of lizards. 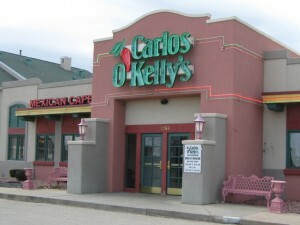 But, I’m getting ahead of myself, because before we did all that, we ate lunch at Carlos O’Kelly’s. It’s not a huge menu, and it’s mostly variations on their normal menu items. 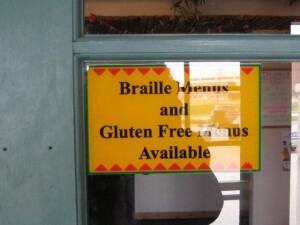 But for those of us eating gluten free, any time you find a restaurant that actually has a special menu for you, it’s a reason for celebration. Vegan-friendly it was not. In fact, most items were heavy on the dairy and meat. Apparently, their tomato-based enchilada sauce has wheat in it (a common issue). So I had to go off menu a bit. I decided to have the garlic chicken, since I will still eat chicken and turkey on occasion. I told my server that I couldn’t have dairy either, and asked her to make sure they left off the cheese sauce and all the cheese garnish. It turned out that my server is also gluten free, and she commiserated with me a bit about being both gluten and dairy free. The chicken was moist and flavorful. The pico de gallo was fresh tasting. The beans were your standard refried beans. Overall, the food was nothing to swoon over. But, just the fact that this small regional chain cares enough to create a gluten free menu makes me oh so happy. Hm. Doesn’t look like they have one anymore. Bummer.